“Welcome! Sochi 2014” [Not]. 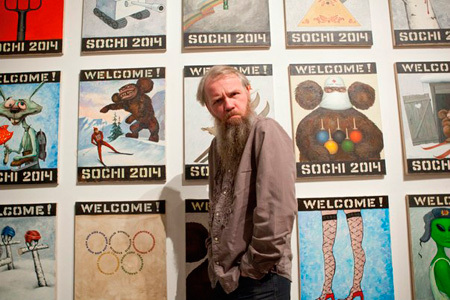 Vasilii Slonov thought he got his 15 minutes of fame when his vivid posters commenting on the upcoming Winter Olympics in a popular summer resort town in Russia were selected for exhibition at the annual summer festival “White Nights in Perm.” The festival was organized by the director of the Perm Museum of Contemporary Art, the renowned Marat Guelman, and Slonov’s works would have been seen by the thousands of the festival attendees. However, the promise of reaching his audience was short lived as Mart Guelman was dismissed from his position as director of the Museum and Slonov’s exhibit was shut down. Now, Guelman is under investigation into misappropriation of the festival funds, while Slonov stands accused of showing signs of extremism. How predictable. Sources: LiveJournal; NBCWorld News; The ArtNewspaper; Marina Kamenev, “Russia Cracks Down on Political Art,” TIME (June 21, 2009).